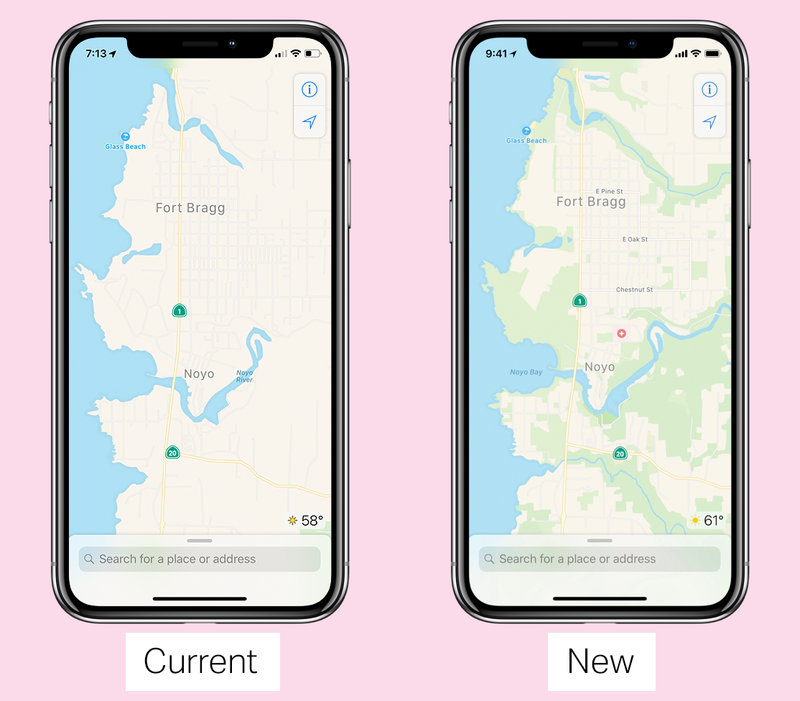 Earlier today we revealed that Apple was re-building maps from the ground up. These are some questions from readers that came up when we went live. You can ask more questions here and I’ll try to add them. What part of Maps will be new? The actual map. Apple is building them from scratch, with its own data rather than relying on external partners. What does that mean in terms of what I’ll see? New foliage markers, showing you where ground cover like grass and trees exists more accurately. Pools, parking lots, exact building shapes, sports areas like baseball diamonds, tennis and basketball courts and pedestrian pathways that are commonly walked but previously unmapped. There are also some new features like the ability to determine where the entrances are to buildings based on maps data. Will it look visually different? Does it use information from iPhones? Yes. It uses segments of trips you take that have been anonymized called probe data to determine things like “is this a valid route?” or to glean traffic congestion information. Can I be identified by this data — does Apple know it’s me making the trips? No. The only device that knows about your entire trip is your personal device. When information and/or requests are sent to Apple, a rotating random identifier is assigned to chunks of data, which are segmented for additional safety before transmission. Basically, all Apple will ever see is a random slice of any person’s trip without beginning or end connected directly, which it uses to update its maps and traffic info. Not only can it not tell who it came from, Apple says it cannot even reconstruct a trip based on this data — no matter who asks for it. Yes. It will not happen if you do not turn on location services, and it can be toggled off in the Privacy settings for Maps. It’s not a new setting, it’s just the existing maps setting. Will it use more data or battery? Apple says no. It’s saying that the amount of both resources used are so negligible as to be swallowed up in normal efficiency gains. When is it coming to the rest of the world? Bay Area in beta next week and Northern California this fall were as much as I got; however, Apple SVP Eddy Cue did say that Apple’s overall maps team was global. We’ve got a dedicated team — we started this four years ago — across a variety of fields from ML, to map design, to you name it. There’s thousands of people working on this all around the globe from here in the Bay Area, to Seattle, Austin, New York. We have people in other countries, in cities like Berlin, Paris, Singapore, Beijing, Malmö, Hyderabad. This team’s dispersed around the globe. It’s important to have that when you’re trying to create and do this. We’re trying to look at how people use our devices all around the world. Our focus is to build these maps for people on the go. Does this mean street view mode is coming? Maybe; Apple did not announce anything related to a street-level view. With the data that it is gathering from the cars, it could absolutely accomplish this, but no news yet. The computer vision system Apple is using can absolutely recognize storefronts and business names so I’d expect that to improve. Will building shapes improve in 3D? Yes. Apple has tools specifically to allow its maps editors to measure building heights in the 3D views and to tweak the shapes of the buildings to make them as accurate as possible. The measuring tools also serve to nail down how many floors a building might have for internal navigation.